Background: Despite availability of variety of antibacterial agents, re-emergance of pathogenic bacteria is still a serious medical concern. Identification of new, safer, and selective antibacterial agents is the key interest in the medicinal chemistry research. 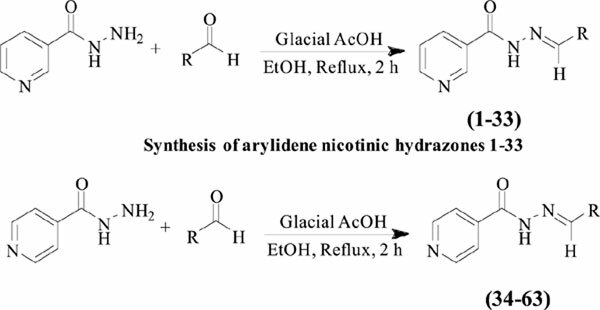 Methods: A library of synthetic arylidene nicotinic and isonicotinic hydrazones (1-63) were investigated for antimicrobial activities. Results: A number of derivatives showed significant to moderate antimicrobial activities against Gram positive and Gram negative bacterial cultures. Few compounds also showed antifungal activity against fungal cultures. Minimum Inhibitory Concentration (MIC) was calculated for the most active compounds 1, 7, 11, 19, 34, 46, 50, 51, and 55 against gram positive and gram negative cultures. Conclusion: Newly identified compounds may serve as lead for future research in order to get the more powerful antibacterial agents. Keywords: Nicotinic hydrazones, isonicotinic hydrazones, in vitro, antimicrobial activity, MIC, antifungal. Keywords:Nicotinic hydrazones, isonicotinic hydrazones, in vitro, antimicrobial activity, MIC, antifungal. Abstract:Background: Despite availability of variety of antibacterial agents, re-emergance of pathogenic bacteria is still a serious medical concern. Identification of new, safer, and selective antibacterial agents is the key interest in the medicinal chemistry research.